Last Tuesday evening Ballylough minors were away to Rosconnor Gaels, the Loughinisland/Darragh Cross amalgamation. The Loch had wind advantage in the first half and built up a sizeable lead to defend in the second period. In the second half a strong team performance continued to take the game to the opposition for a comfortable win in the end. 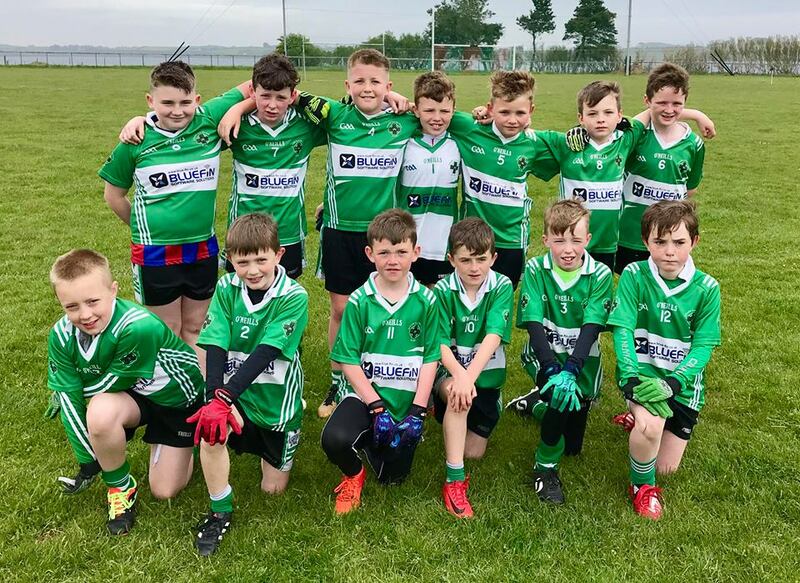 Ballylough team: M Croskery, R Quinn, J Matthews (1-0), B Rogan, T McCullough, R McMullan, C Murray, E Lundy (2-2, 1 pen), O Flanagan (0-2), B Ogle, S Croskery (1-6), C Burns (1-4), A Flanagan (1-0), D McMullan (2-3), E Lyttle; Subs: C Murphy, R Walsh (1-1), P O’Hare, D McKibben. Next game is at home against RGU on Tuesday 12th June. Our U16’s played their first two games in the East Down A League. They were at home to RGU in their opening game. This was the first time these two clubs have ever met in East Down competitive football. The first half was a closely contested affair with the ‘Fin leading 1-4 to 0-5. The ‘Fin had their keeper Ryan Morgan to thank having pulled off a superb double save. In the second half RGU bagged four majors and they looked certs to win the game but the ‘Fin battled back with a succession of points from Morgan Croskery to draw the game. In fact only for a free going wide with the last kick the ‘Fin would have won it. Croskery top scored with 1-9 over the hour. Aaran Flanagan 1-1, Damian McMullan 0-2, Conor Steen 0-1 and Rhys Clarke 0-1 also on target. Final score Aughlisnafin 2-14 RGU 4-8. In their second game three days later the U16’s travelled to Loughinisland. With five absentees the ‘Fin competed well to earn a credible draw for the second time in four days to go joint top of the division. Morgan Croskery has been in fine scoring form for the U16’s this season and scored 0-7. Ethan Lyttle (1-3), Conor Matthews (0-2), Aaran Flanagan (0-1) and Conor Steen (0-1) also among the scorers. There will be a break from matches due to the exam period and the next game will be at home to Castlewellan on Thursday 21st June. Well done to U16 players Morgan and Damian on their involvement for Down U16 ETS draw against Meath recently. Morgan was the goalkeeper and Damian lined out at full back. Both have be starring for the Ballylough minor team in the All County league this season as well. Our U14’s were short of three players due to injuries for the visit of a near full strength Bright squad to Pairc Baile Anna in what was a ‘top of the table’ tussle but put in a great team performance to win the game. The defence worked their socks off and there was 15 minutes on the clock before the Fin conceded their first score. The Fin led 4-6 to 0-5 by the interval. In the second half Bright added 2-4 but the Fin tagged on a further 3-9 to win the game. Aughlisnafin (11 aside): O Maguire, K McComiskey, J King, J Steen, R Tweedie, C Walsh 0-2, M Quinn 4-7, M Flanagan 0-2, D Pickering 2-0, C OHare, E Murray 1-3; Subs: R McCann, C McDonald, C Flanagan 0-1. Next game is away to Kilclief. Our U12’s had two games recently. First off they travelled up to Holywood to play St Paul’s Sunday week ago. With only ten players available both clubs agreed to play the fixture as 9 aside. The hosts edged the first half 1-8 to 1-5. In a high scoring second half the ‘Fin outscored St Pauls 4-10 to 6-3 but fell short by just two points. Final score Aughlisnafin 5-15 St Paul’s 7-11. Aughlisnafin (9 aside): S Croskery, R Quinn, R Croskery, C Flanagan (0-4), J Steen (0-4), M Flanagan (3-2), R McCann, D Steele (0-2), J Lenaghan, B Clarke (2-2). On Sunday past the U12’s got back to winning ways with a superb win away to Kilclief. The Fin had Conor O’Hare and Odhran Murray back in the starting 11 after their unavailability last week. The Fin captain Sean Croskery won the toss and elected to play with the strong downfield wind first half. Dillon Steele and Ryan McCann hit the first two goals before Kilclief replied with a point. This was to be the home team’s only score of the first half as the Fin defence were well on top. The two Ryans, Quinn and Croskery were tenacious in the tackle and always picked out their passes as they looked to set up attacks. Half backs Conor OHare and Caolan Flanagan also intercepting and turning over Kilclief possession as they tried to create scores to no avail. The Fin went on to add 4-6 without reply. Brogan Clarke was clinical with 2-2 from play with several assists. McCann added a second goal and OHare also netted after some nifty soccer style footwork. Marty Og Flanagan and Ryan Croskery tagged on a point apiece. Half time Kilclief 0-1 Aughlisnafin 6-6. The wind advantage was now with Kilclief for the second half but the Fin defence continued where they left off. Jude Lenaghan came on for Odhran Murray and the Fin played with an extra defender as the worked hard to keep Kilclief at bay. Brogan Clarke got another goal to complete his hat trick and another point from the midfield dynamo Marty Og stretched the Fin’s lead further. Kilclief were mounting more attacks but the Fin stood strong. It was not til the last quarter of the game that Kilclief started to turn the scoreboard with a goal and three points for their efforts. Shea Boden Hall came on for the Fin and a few positional changes meant Ryan Quinn moved to the forward line alongside Shea. Marty Og got a third point of the game and Ryan Quinn won and scored a point from the free. Polished performances for all with Joseph Steen a standout at midfield. Captain Ryan Croskery also impressing in nets when called upon. Full time Kilclief 1-04 Aughlisnafin 7-09. Aughlisnafin: S Croskery, R Quinn (0-1, 1f), R Croskery (0-1), C O’Hare (1-0), C Flanagan, M Flanagan (0-3), J Steen, R McCann (2-0), B Clarke (3-2), D Steele (1-2); Interchange: J Lenaghan, S Boden-Hall. Next match is away to Dromara. Our Year 6’s & Year 4’s will have Go Games in Drumaness this Saturday. Our seniors are at home to Ballykinlar this Friday at 7.30 pm. Welcome back to Naoise Davey who has returned from a stint with St Brendans Manchester. Good boost to the panel. Lotto (11 May) numbers were 1, 14, 17, 22. No Winners. Lotto (18 May) numbers were 3, 13, 21, 22. No winners. Jackpot now £3,350. Visit our website www.aughlisnafingac.com and click on the ‘Play Lotto’ klubfunder link before the Friday draw. Tickets can also be obtained from Mulhollands Bar or from all usual sellers.